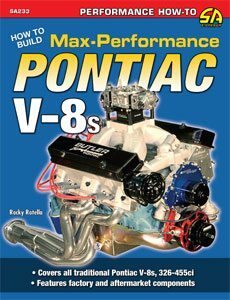 When building a max-performance Pontiac V-8, each engine is almost always unique unto itself. Depending upon the racing class restrictions, chassis hurdles, intended performance level and usage, and budgetary concerns, very few maxperformance efforts are exactly identical. There is a wide variety of machine shops, engine assemblers, and engine builders that are quite capable of building a very strong Pontiac V-8 and many specialize in and race Pontiacs. The Source Guide provides contact information for companies that I am comfortable recommending. 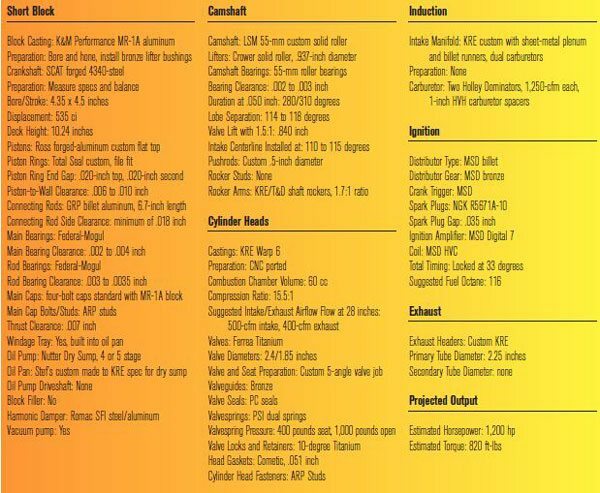 I contacted a select number of Pontiac- specific engine builders and asked them to provide recommendations for specific max-performance engine builds. 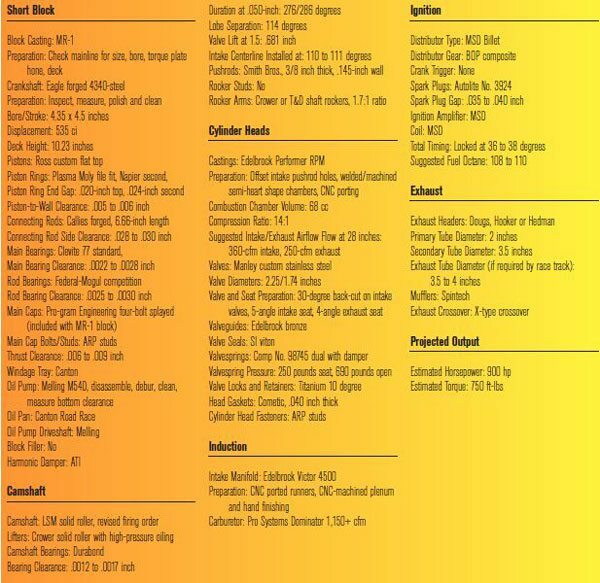 Some builds include a stock Pontiac block while others use an aftermarket block, some are naturally aspirated while others use forced induction or accommodate nitrous oxide, and some operate on commonly available pump gas while others require race gas. 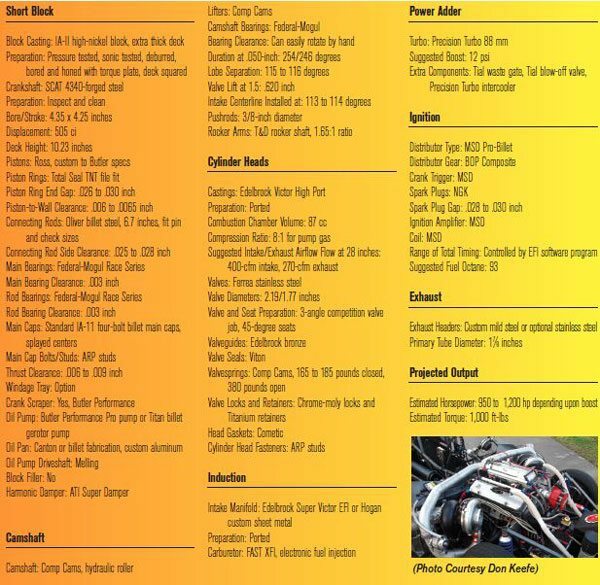 The only restriction that I imposed upon each builder was that the engine package must operate reliably and perform within a reasonable range of the estimated horsepower and torque values. A 414-inch Pontiac V-8 is capable of delivering strong horsepower and masssive amounts of usable torque while operating reliably on pump gas. 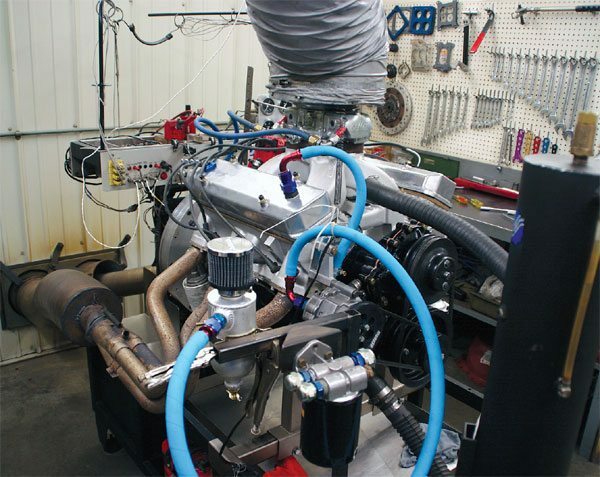 This Butler Performance combo made 578 hp on 588 ft-lbs and operates on 89-octane fuel. It’s extremely docile and sounds quite healthy. 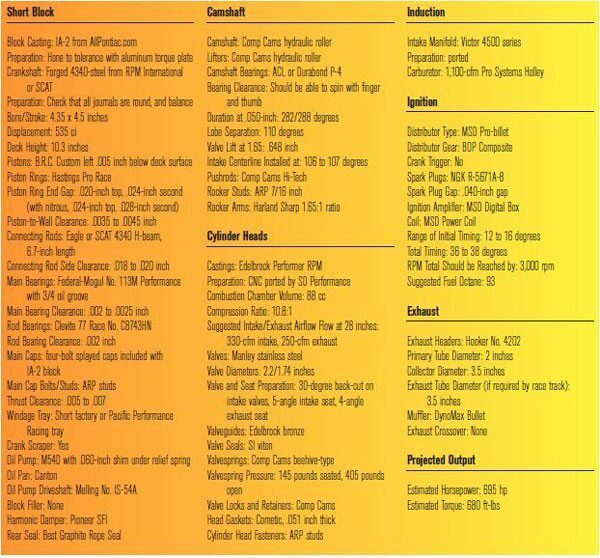 The max-performance combinations on the following pages can be considered guidelines to arrive at the supplied horsepower and torque estimations. While any number of the recommended components could be replaced with like items, performance or reliability could suffer. 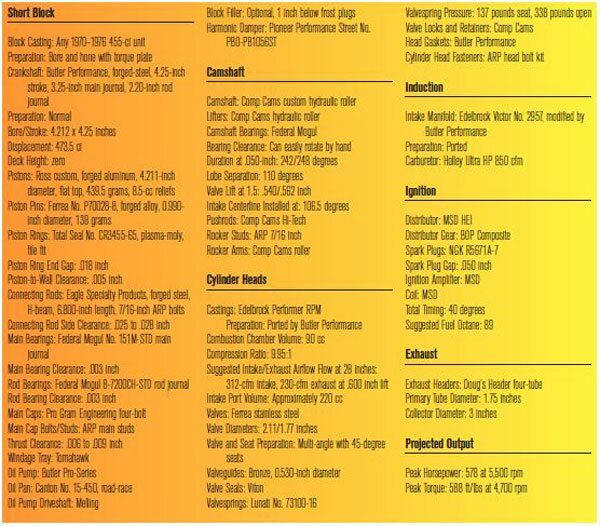 If your build deviates from these, I strongly suggest you consult with your builder to determine the effects that might have. 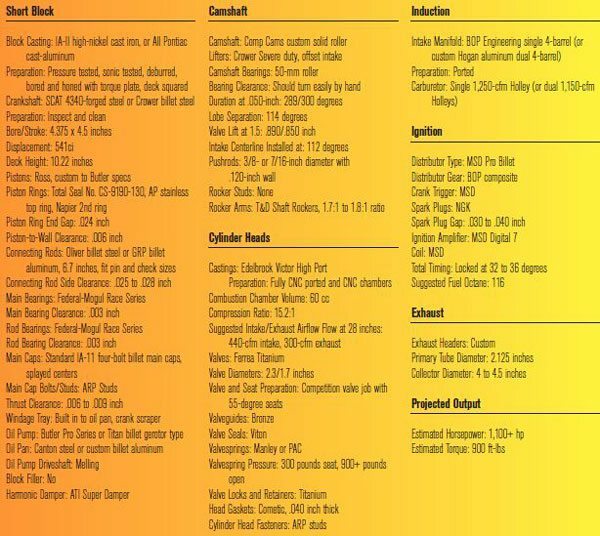 Reliable operation on premium-grade pump gas and generous power amounts are quite possible when combining a stock Pontiac block and certain aftermarket components. With the significant cost of 91- to 93-octane fuel these days, combinations compatible with 89-octane gas are gaining popularity. With the assistance of Butler Performance, we built a 474 that provides more than 575 hp on mid-grade fuel. Horsepower and torque greater than 600 is possible when pushing compression toward 10.5:1, but it requires a steady diet of premium-grade fuel. If you plan on driving your Pontiac regularly, and want a low-maintenance design that operates detonation-free, this combination may be for you. Ken Keefer is a popular Pontiac engine builder located in Brooksville, Florida. He specializes in large-cube Pontiac V-8s that operate on commonly available pump-gas, and are capable of dominating the street classes at the drag strip. Through much trial and error, Ken has uncovered what it takes to make a Pontiac V-8 survive on rather large doses of nitrous oxide. Dave Bisschop takes a very serious approach toward max-performance Pontiacs. He has been building and racing Pontiacs for several decades, and is always looking for new ways to extract even more performance. Some of the quickest Pontiacs in the country feature cylinder heads that have been ported by his company, SD Performance in Chilliwack, British Columbia. Dave is considered to be among the very best Pontiac builders in the country today and the combinations he assembles delivers the performance he claims. Butler Performance in Leoma, Tennessee, has been building fast Pontiacs for a number of years and sons David and Rodney have picked up where their father, Jim, left off. 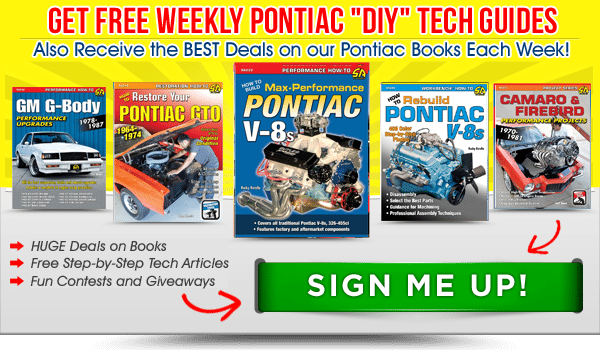 David Butler is among the most knowledgeable Pontiac builders around today and his approach toward any type of Pontiac performance can be backed up with successful results. With the ability to produce a stout performance engine with a stock appearance or thousands of horsepower from a boosted application, Butler Performance can assist you with all your Pontiac needs. Kauffman Racing Equipment (KRE) in Glenmont, Ohio, is among the very best in the today’s Pontiac performance market. Since introducing its own castaluminum d-port cylinder head for Pontiac applications a few years ago, KRE has gone on to develop cast-iron and -aluminum large-bore Pontiac blocks and highperformance cylinder heads known as the High Port and Warp 6. 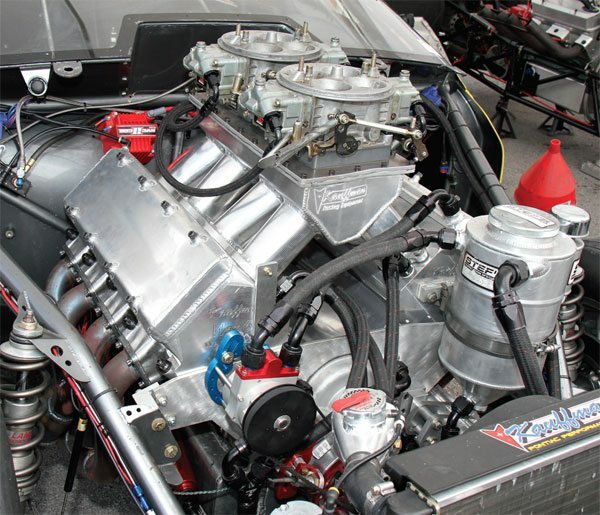 Jeff Kauffman provides a very high performance combination using his company’s newest highperformance cylinder head.